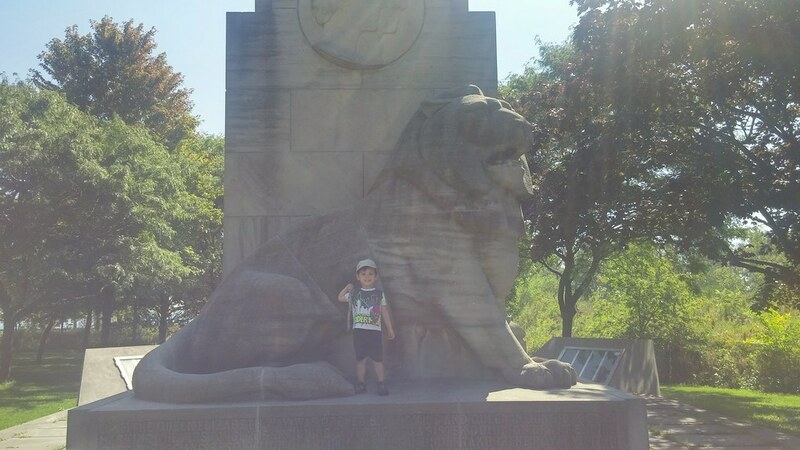 My youngest son has taken a shine to a statue of a lion situated by the off-lease dog park just west of Windermere by the Waterfront Trail. Yesterday, I snapped a pic of him and his lion friend. You're forgiven if you didn't know about this lion. I have probably biked or walked the Waterfront Trail in this area over 500 times over the past three years and didn't know it existed. It's tucked away out of sight in an area you'd only visit if you were taking a dog to the dog park. As soon as I shared the above picture, I was told by a commenter it was the Lucky Lion. Here's a good history lesson on the Lucky Lion. It was one of Toronto's most famous early monuments — so well-known to locals that many simply called it the Monument. It was erected in 1939, in the opening days of the Second World War, to celebrate the city's newest highway. The beautiful Queen Elizabeth Way would stretch from the Humber River around the bend of Lake Ontario to Niagara Falls. Queen Elizabeth The Queen Mother herself came to open it that summer, on tour with her husband, the stuttering King George VI. (She was the mother of Queen Elizabeth II, better remembered these days as the Queen Mum.) It was the first time a reigning monarch had ever visited Canada — or any Dominion for that matter — a way of rallying the Empire as war with the Nazis loomed. And so, the new monument would not only celebrate the new road, but also commemorate the royal visit and Canada's role in the Second World War. A tall column would stand at the entrance to the QEW by the mouth of the Humber River, topped by a crown. A relief would portray King George and the Queen. And at the base of the column, there would be a lion sculpted by one of Toronto's most famous and respected sculptors: Frances Loring. 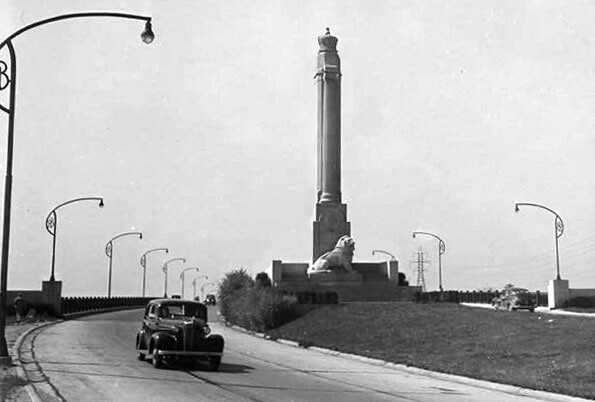 In 1974, when the QEW was widened to twelve lanes, the lion monument was going to be demolished until an outpouring of support resulted in the lion being moved to where you'll find it today. yup - I discovered him about 7 years or so while geocaching. there was a cache tucked right into him somewhere. sadly that cache is no longer maintained. Actually the last time I saw him was on the highway, when Mom and Dad were taking us from downtown to the Black Creek Pioneer village. I've seen pictures of where he was moved to, but have not seen him myself, at his new home.